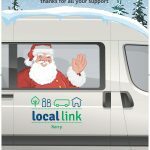 Local Link Kerry wish all our Passengers a Very Happy Christmas and Happy New Year. Please listen to our advert. It has been a great Year with new Services all over Kerry and there’s more to come in 2018. Local Link Kerry is so proud to win the Best Community Enterprise at The Kerryman Business Awards in The Ballygarry House Hotel. We were also a finalist under the Social Corporate Responsibility Category.
. Local Link Kerry are absolutely thrilled to be shortlisted in the The Kerryman Business of the Year Awards under Best Community Enterprise & Best Social Corporate Responsibility Categories.. Roll on the 13th October..